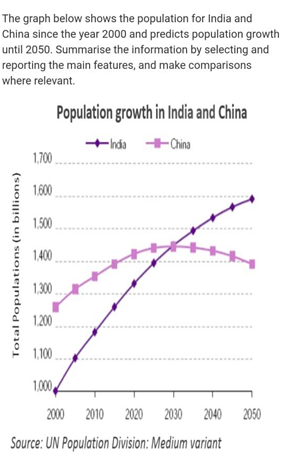 The graph below shows the population of India and China since the year 2000 and predicts population growth until 2050. Summarise the information by selecting and reporting the main features, and make comparisons where relevant. Here is a band 8 Academic IELTS report on this topic submitted by one of our students. 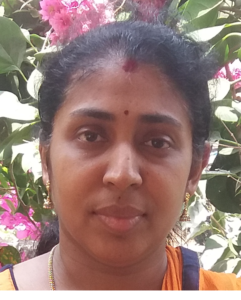 Need help with IELTS writing? Get your task 1 reports, letters and task 2 essays corrected by me. The given graph illustrates the population of India and China over the last twenty years and also predicts its growth for the next thirty years up to 2050. There has been a sharp rise in the population of India since the year 2000 and it is predicted to continue to rise albeit with lesser intensity over the next three decades. China, on the other hand, has had a more gradual rise in its population over the previous two decades. Their population growth curve is expected to plateau in the next ten years and decline thereafter. In the year 2000, China’s population stood at 1.250 billion compared to India’s one billion mark. Both these countries saw a rise in their population but the rate of their growth varied drastically. Currently, India’s 1.320 billion stands marginally behind China’s 1.420 billion. India is expected to match China’s population by 2030 at 1.450 billion each. The growth curve for India continues to remain positive after 2030, reaching 1.600 billion by the year 2050. On the other hand, China will have a negative growth, wherein their population is expected to fall below 1400 billion in 2050.